County in South Alabama formed 1821 whose county seat is Andalusia. In 1980 the population was recorded as 40,373 but had dropped to 36,478 by 1990. The County has a land area of 1,035 square miles, an average of 35.5 people per square mile. The populated locations are at Babbie, Carolina, Florala, Gantt, Heath, Horn Hill, Libertyville, Lockhart, Onycha, Opp, River Falls and Sanford. Non populated areas: Antioch, Beck, Beda, Beulah, Blairs, Blue Springs, Boston, Boykin, Brooks, Cedar Grove, Clearview, Coldwater, Dunns, Duvall, Eoda, Estohel, Fairfield, Falco, Five Points, Friendship, Harmony, Howells, Huckaville, Loango, McRae, Opine, Rawls, Red Level, Rome, Rose Hill, Stanley, Stedman, Straughn, Valley of Shiloh, Wiggins and Wing. A coastal plain area bordering on Florida, drained by Conecuh River and Patsaliga Creek. The area which now composes Covington County, Alabama was originally inhabited by the Creek Indians. There are Indian mounds, arrowheads and other relics to be found here. The county was declared a disaster area in September 1979 due to damage from Hurricane Frederic and again in October, 1995 due to Hurricane Opal. Ponce de Leon came into Covington County in his quest for the Fountain of Youth. Desoto explored Covington County in the course of conquest and the Spanish established a little settlement on the Conecuh River which came to be known as Montezuma. After the War of 1812, Andrew Jackson, former U.S. President, is said to have come from South Carolina and travelled through this area en route to New Orleans. He cut three notches on trees as he passed through this wilderness to enable him to find his way back. Andalusia has an East Three Notch Street and a South Three Notch Street. Troy has a South Three Notch Street. These streets are supposed to lie on the famous "Three Notch Trail". The State of Alabama was admitted to the Union in 1819 and Covington was made a county by legislature in 1821. It was created from Henry County. This new county was named in honour of Brigadier General Leonard Wailes Covington, who was a native of Maryland, killed in the War of 1812. At that time, Covington embraced several other counties, but through the years has been reduced to its present size by the carving out of Dale and Geneva Counties. White settlers came from Georgia on ox wagons to what is now Covington County in 1816. An early settlement was near Green Bay. Another settlement was near Rose Hill, settled by the people from North and South Carolina. The earliest church was established near Rose Hill in 1823 and was called the Macedonia Church. The earliest settlement was on the Conecuh River, four miles west of what is now Andalusia. This community was the first county seat and a post office called Montezuma was established in 1829. There was river traffic from Pensacola to Montezuma in those days. Immigrants flocked in from Georgia and the Carolinas after a Federal Law of 1836 had ordered the Indians to be moved west of the Mississippi. The first land sold by the U.S. Government in this county was near the present Community of Heath and sold through the Sparta Land Office in Conecuh County. Later, this land office was moved to Elba. In 1841, the lowlands around Montezuma were flooded. A yellow fever epidemic occured which brought much disaster and disease to the lowlands. The settlers were forced to flee to higher grounds. They selected the highest point in the vicinity, a place of safety on the watershed that today is the City Square of Andalusia. This was called "New Site" until 1846 when a post office was established and the town designated as Andalusia. No one knows where the name Andalusia originated, however, legend has it that Spanish explorers, Ponce de Leon and Desoto, and their men were the first white men in this area. It is felt that they were responsible for the Spanish influence. It is assumed that since Spain has an Andalusia Province, that this City was so named because of this influence. In 1868, State Representative, Mancil, passed a bill in the Legislature of Alabama to change the name of Covington to Jones County. His purpose was to please the Judge of Probate, Josiah Jones, who had helped Mancil to be elected. Communication was not good in those days and the first that Jones knew about it was when he met Mancil on the street after his return home. Upon hearing that the Covington name had been changed, Jones was so angry that he threatened Mancil unless he changed the name back to Covington. Mancil then had the county name changed back to Covington. Thus Covington was Jones County for only the short period of four months in 1869. 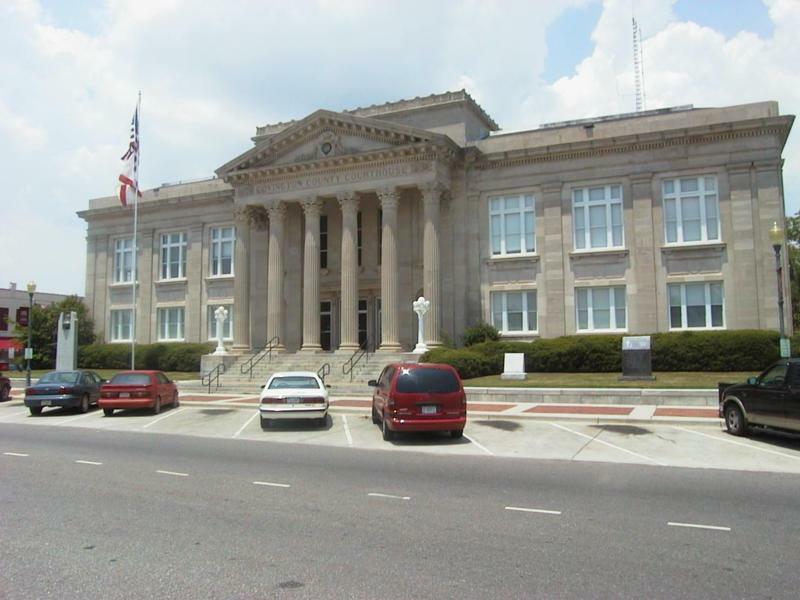 There have been five courthouses in Covington County. The first was a log structure in Montezuma. The second a log structure in Andalusia, which burned in 1878 and destroyed all records. The third, a clapboard building was detroyed by fire in 1895. It was located east of the town square in Andalusia and had one grave in the courtyard. The fourth a brick building, occupied the centre of the town square in Andalusia and stood until the present courthouse was erected in about 1916. Main trades within Covington County are cotton, corn, hogs and manufacturing. A particular place of interest is the Conecuh National Forest in the South. The Covington County Bank, 225 East Three Notch Street, Andalusia 36420 appears in The Million Dollar Directory 1988 (America's Top 50,000 leading private & public companies). It was organised in 1947, originally located on Curt Square in Andalusia and began business with a staff of five. The bank moved to it's present facilities in 1968. In 1985 it was purchased by local investors and by 1989 had a staff of 40 with assets of $73,066,881. Other large businesses are the Covington Casket Co. Inc., 140 North Cotton Street., Andalusia 36420 and Covington Heavy Duty Parts Inc., 1001 By-Pass West, P.O.Box 1049, Andalusia 36420. Easy access through an extensive transportation network makes Covington County a hub of business activity in South Alabama and Northwest Florida. Alabama Highway 55, with access to I-65, currently undergoing four-lane expansion. U.S. Highway 331, from Montgomery to the Gulf Coast, undergoing four-lane expansion in Alabama. U.S. Highway 84 is being studied to determine the best route for future four-lane expansion. Access to passenger air service in Montgomery, Dothan, Birmingham, Pensacola, and Atlanta. Recently modernized, state-of-the-art municipal airport, located between Andalusia and Opp, supports all business class aircraft with instrument approach systems. Automated Sunfire Observation Weather System. 20,000 gallon JetA fuel farm with 3 rapid (HOT) refueling points. Heliport Operations/Administration facility with new paved road and parking lot. 8000 sq. ft. aircraft maintenance facility. 4000 sq. ft. terminal and industrial park center. 16 single engine aircraft "T" hangars. 2 single engine aircraft stall hangars. 6 twin engine aircraft stall hangars. New taxiway into hangar areas. Global Position System (Aircraft Navigation & Approach System). Government Defense Fuel (Aviation) Contract refueling facility. Airport radar with Ground Control Approach capability. New aircraft parking apron for 40 aircraft. Heliport lighting and wind instrumentation systems. Airport & industrial park sewage system with 3 pumping systems. New airport industrial park road. 183 acre airport industrial park. 30,000 square feet spec building available Fall '98. Covington County was officially declared a division within the state of Alabama on Dec. 7, 1821. 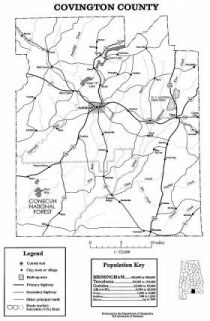 Where do citizens interested in history find that or any other information about the origin, people and events that have made Covington County what it is today? The answers can be found in the Andalusia Public Library and in the work of dedicated historians who have put together collections that preserve the story of the people and places of this county. There are, however, hard-cover books containing information about the county. “From the Halls of Montezuma,” written by Sidney Waites, contains sketches of Covington County. “Early History of Covington County, Alabama — 1821-1871” was written by Wyley Donald Ward, of Andalusia, and “Covington County History — 1821-1976” was authored by the late Gus J. and Ruby R. Bryan of Opp. Ward also has a book on land grants in the county. Those are also the books listed in the libraries of major state universities. Neither the University of Alabama, Auburn University nor Troy State University has ever had a history student write a thesis on the history of Covington County. They do, however, list the books that are available on the county history. There are also old phone directories as well as cassette recordings of some people who shared their knowledge of the county’s history. Both the Ward and Bryan books began with the formation of the county. In his book, Ward gives more in-depth information on the background and events leading to the formation of the county, but overall the two books agree on the story of the county’s formation. In the preface to his book, Ward sets out his goals and purpose in writing the history. “This book is intended to serve as a quick reference to some of the major events and developments that occurred during the first 50 years of Covington County’s existence,” he writes. Unlike Ward, Ruby and Gus Bryan never lived to see their book published. In the book’s acknowledgments, the Bryan’s daughter, Evelyne Bryan Thomas, writes about her parents’ commitment to preserving the history of the county that they came to call home. “This book was conceived many years ago by the author, my father, who began his serious collection of information about Covington County and its pioneer families in the 1940s,” she writes. Both books have much of the same information about early county history, where they differ the most is in the scope they cover. Ward’s book goes through 1871; while the Bryan’s history covers county events through 1976. Taylor said the books as well as the other information available at the library are used a great deal. Taylor said many are searching for information about their own family histories and come to the library because the families have ties to Covington County. “When someone is looking for information about genealogy, the first place they go is often the library,” she said. Those people who come to the library searching for information owe a debt of gratitude to those who have taken the time to preserve the county’s history, Taylor said. William D. Barnard of the University of Alabama wrote the introduction to the Bryans’ “History of Covington County” and echoed Taylor’s thoughts on the importance of those who preserve local history. “The way of life of our forebears has an intrinsic interest for us, and it is often through history such as this one of Covington County that future generations will know how it was that the county seat was located in Andalusia, will learn of the origins of River Falls and Opp,” he writes. "I see Karen Taylor, the librarian at Andalusia Public library mentioned me in her statements to you. I just thought I'd add that I've published a number of volumes on the county including the only published in book format listings for cemteries in the county. My good friend and fellow genealogist Joan Hallford Hidle and myself published three volumes covering all cemeteries (including abandoned ones) for the entire county..the first two were published as books the third we opted to publish only on the internet having already posted all the contents of the first two online by that time. My website Tracking Your Roots therefore has cemetery surveys done for every cemetery in Covington Co., AL --these were done around 1995. In addition many other Covington resources I have accumulated over the years (some published as books, others not) also appear on the website at http://trackingyourroots.com/covington.htm." "One more thing Martin..this is a story I've never told anyone that was handed down to me in my own family.